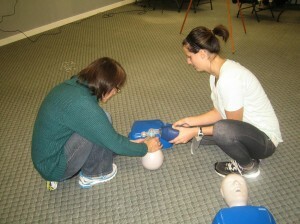 Windsor First Aid provides a range of stand-alone CPR classes. The most extensive CPR and AED program available from St Mark James and offered by Windsor First Aid is cardiopulmonary resuscitation level “C” for health care providers (also known as CPR “HCP”). This training course shows individuals cardiopulmonary resuscitation procedures for victims of every age group. Individuals will understand how to use advanced devices and skilled support. This particular program is designed for participants that work in or want to work in the health care industry. Automated external defibrillator (AED) education is integrated within the course. Sign up is simple and Windsor First Aid offers the best rates on health care provider cardiopulmonary resuscitation programs in Windsor. Browse down to the foot of this page to sign-up for the health care provider cardiopulmonary resuscitation course of your choice. This CPR course is available many times per week at various dates and locations in Windsor. Payment can be paid for the class through a number of methods which include debit, cash or credit. Nearly all students finish the CPR course without trouble. Once participants finish the class they will obtain a workplace approved certificate that meets a number of employment and school requirements. This specific award comes with automated external defibrillator accreditation. This CPR lesson normally requires roughly six hours to complete. Participants will find out the way to handle many different cardiopulmonary resuscitation complications and receive a basic introduction to cardiovascular crisis situations. Students also will learn how to perform two-participant cardiopulmonary resuscitation (CPR). Registration to this program costs 60 dollars. Included within the price is certification charges and a St Mark James training guide. Non-public cardiopulmonary resuscitation (CPR) courses are offered in Windsor by this provider. Get in touch through telephone or electronic mail to schedule a course. Cardiopulmonary resuscitation HCP renewal lessons are offered. Visit the cardiopulmonary resuscitation HCP and AED re-certification site to acquire more information pertaining to specifications and application for health care provider cardiopulmonary resuscitation re-certification courses. Select a course listed below to sign up for your CPR “HCP” and AED course right now. Learn about advanced CPR and AED abilities and techniques in Windsor via Windsor First Aid.